Powerful, fast, strong! The "buffalo". But no, what follows is not a description of the wild animal that roams the North American plains, but of Armoured Recovery Vehicle 3 of the Bundeswehr with the nickname "Buffalo" - or Büffel in German. In 1977, concept studies for a new armoured recovery vehicle were started for a vehicle that could recover a Leopard 2 tank and lift the heavy turret of the Leopard 2A5 in the field. More generally, loads up to MLC 60 needed be recovered from the battlefield. Just in case you were wondering, ARV1 was the US-designed M88 ARV, and ARV2 was the Leopard 1-based ARV (Bergepanzer 2). The approximately 54-ton Büffel reaches its power to weight ratio of 20.3 kW/t through the use of an 1100 kW 12-cylinder V90° four-stroke, multi-fuel, prechamber diesel engine. The MTU MB 873 Ka 501 accelerates the vehicle to a top speed of 70 km/h. For logistical optimisation, many modules or modified parts of the Leopard 2 MBT have been used throughout the vehicle. The crew consists of three soldiers who are housed in the left front part of the hull. For self-protection, the three-man crew has a Fla-MG 7.62 mm machine gun which can be mounted on the commander's cupola station and is operated from under armour, plus banks of smoke grenade dischargers at the front and rear of the vehicle. As a fully-armoured tracked vehicle, its main tasks are recovering and towing tracked vehicles in difficult terrain, as support during water crossings, and as support during repair work or the removal of obstacles. Furthermore, it can be used in the field for loading and defuelling vehicles. A battle recovery system on the dozer-blade allows the recovery of damaged vehicles on the battlefield under full armour protection. 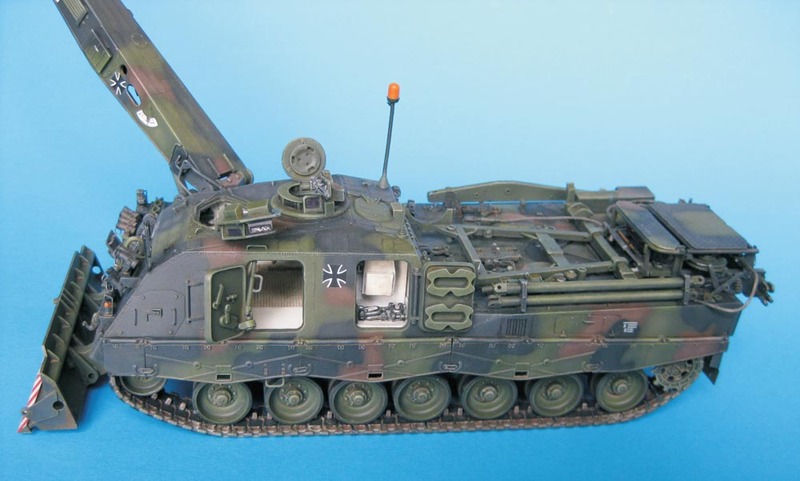 This kit is one of two versions of the Büffel ARV which have been produced by Perfect Scale Modellbau (PSM). Both versions differ only by the extra 24 components for an interior. Item number 35050 contains the interior and item number 35051 is without interior. At the moment, only the kit with interior is available from PSM which was reissued earlier this year (2014). The focus of this review is therefore on the kit with the interior. The kit is shipped in a relatively large, typically sturdy PSM cardboard box. Inside are three ziplock bags, some larger resin components packaged in bubble wrap and the assembly instructions, all enclosed and padded in Styrofoam chips. The kit consists in total of 385 resin parts, a PE fret, twisted copper wire, polystyrene rod and decals as the sum of this multi-media kit. Already, at first glance, the kit makes an excellent impression because it contains all the parts necessary to build a detailed Büffel. The construction manual is A4 format consisting of a total of 8 pages, printed on both sides. 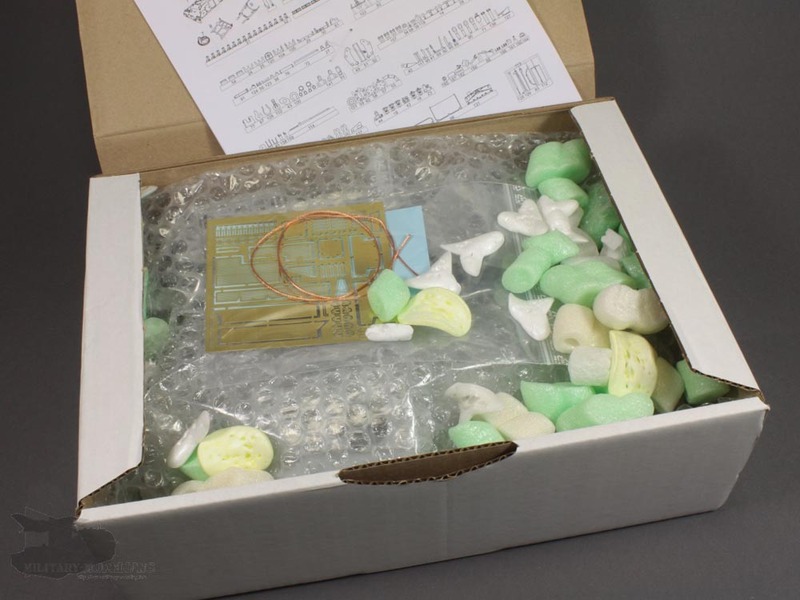 It begins with general warnings for dealing with resin and glue in English and German, a parts list, and a note to check the contents and to directly contact PSM for replacement of missing or damaged parts. In my kit, all of the components were present and undamaged after the first examination. 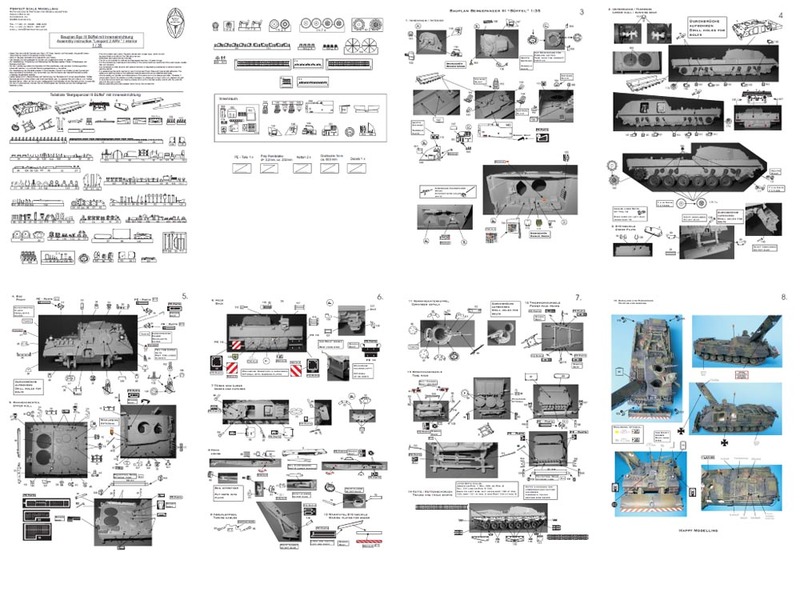 The instructions show the kit's assembly in the form of drawings combined with photos of the corresponding components. Partial painting instructions and for decal placement are included. All text in the instructions is in German and English. 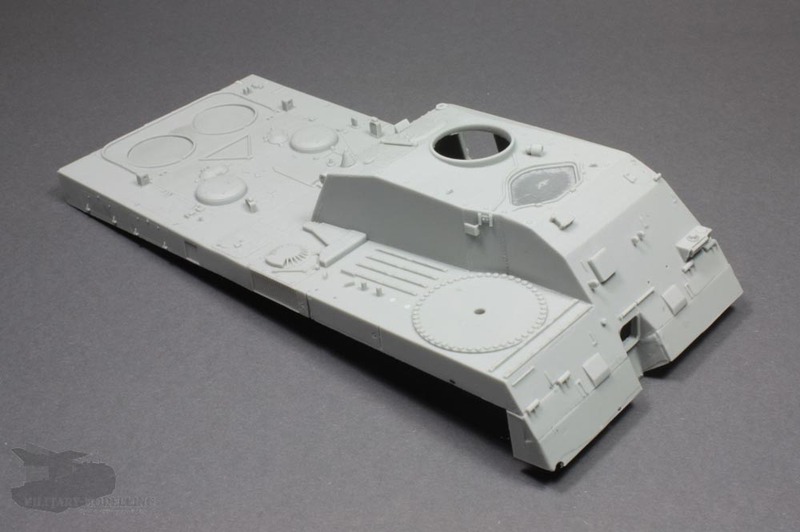 At the end of the instructions, colour photos of a completed model are included as painting instructions. The instructions are clear, with a few exceptions, and the photos should allow assembly without any major problems. The decals supplied are of good printing quality. The colours are bold and the details well-defined. Warning signs, instruments and markings for Bundeswehr machines are provided. 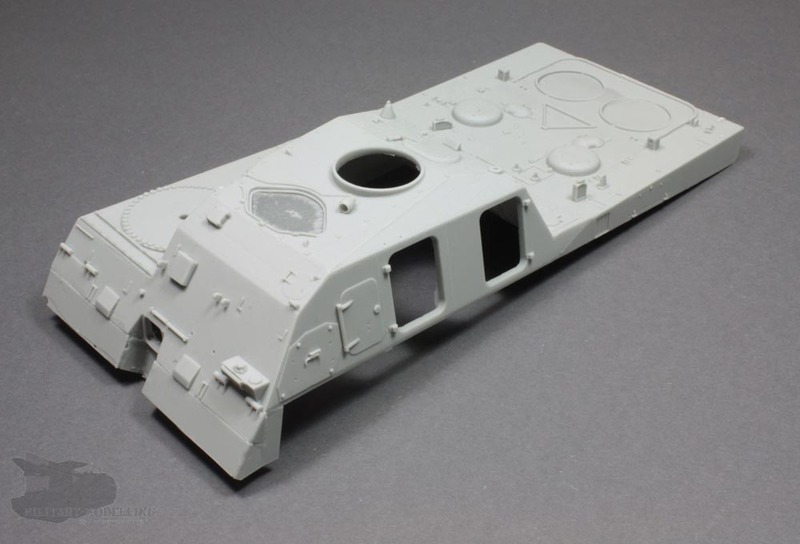 The markings will allow you to build an ARV3 from 1st Armoured Reconnaissance Battalion 11, or from 1st Tank Battalion 363. 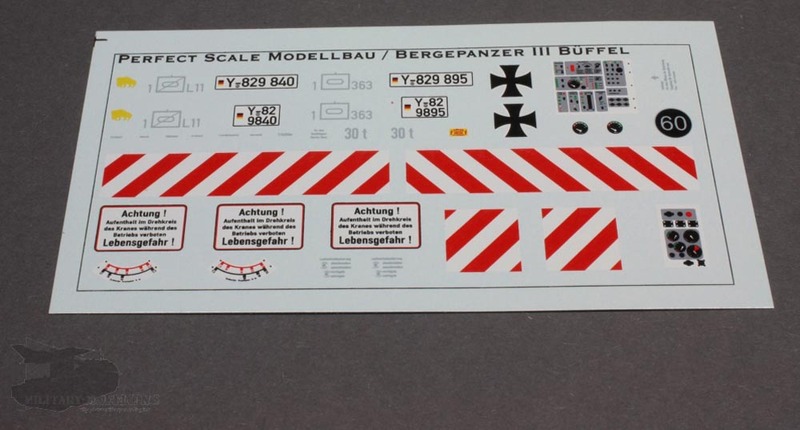 Decals for the markings necessary for the crane system and general warning stencils are included. 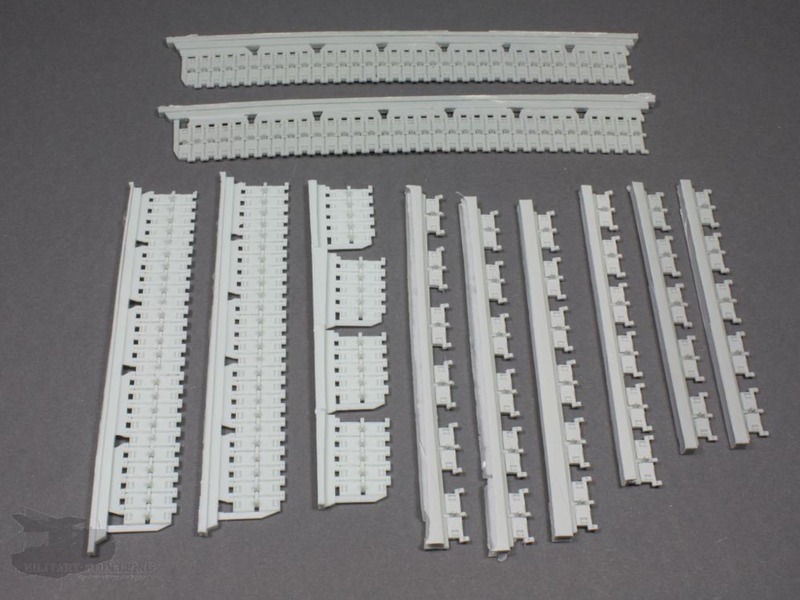 Included in the kit is a photo-etch fret which contains a useful selection of refinements for construction. This includes handles, grilles, turnbuckles, fine chains, wire baskets and rear mud flaps. At this point, my recommendation would be to replace the photo-etched parts for the handles with more three-dimensional fine copper or brass wire. For the crane and tow cables, PSM includes a 60 cm long, 1 mm thick, beautifully twisted copper cable. 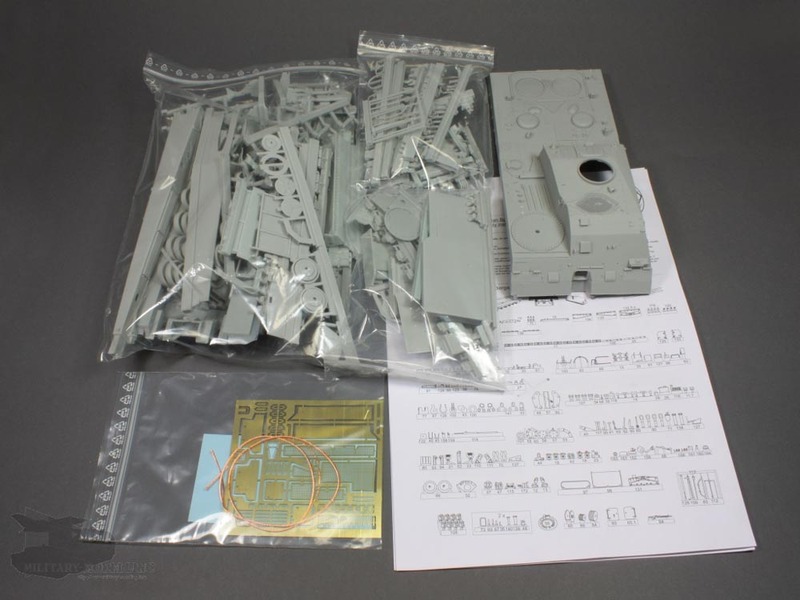 Contrary to previous editions of this kit, the suspension parts are no longer made of injection plastic from Tamiya. They are now completely cast in resin. Shock absorbers, hydraulic bump stops, swing arms, support rollers, sprocket-wheels, idlers and road wheels and - unfortunately - the link and length tracks are cast in resin. 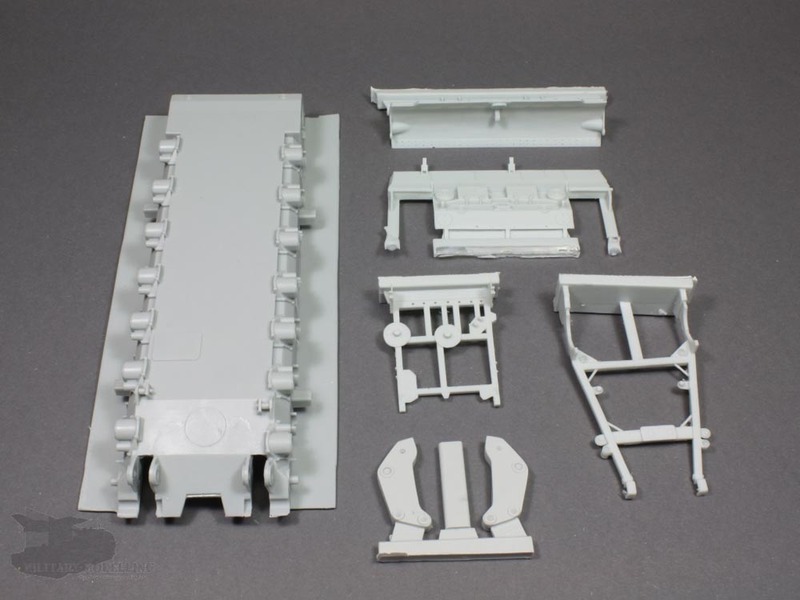 The origin of parts from Tamiya cannot be overlooked. However, the quality of the casting is perfect and shows no defects. For my opinion, only the casting blocks on the wheels are not chosen well. The casting block covers half of the tyre which has to be removed. I would have liked the tracks as individual single-link tracks in this price range. The centre guide is quite delicate and prone to breakage. Here, reference is made to the single-link tracks manufactured by Bronco or Trumpeter. I, for my part, will use the tracks from Trumpeter. The aforementioned 24 parts of the interior are very rich in detail and the casting is again excellent. Neither bubbles nor imperfections can be seen. Seats, fire extinguishers, radios and recovery equipment - everything is there. Here, PSM have gone to a great deal of trouble. Just great! 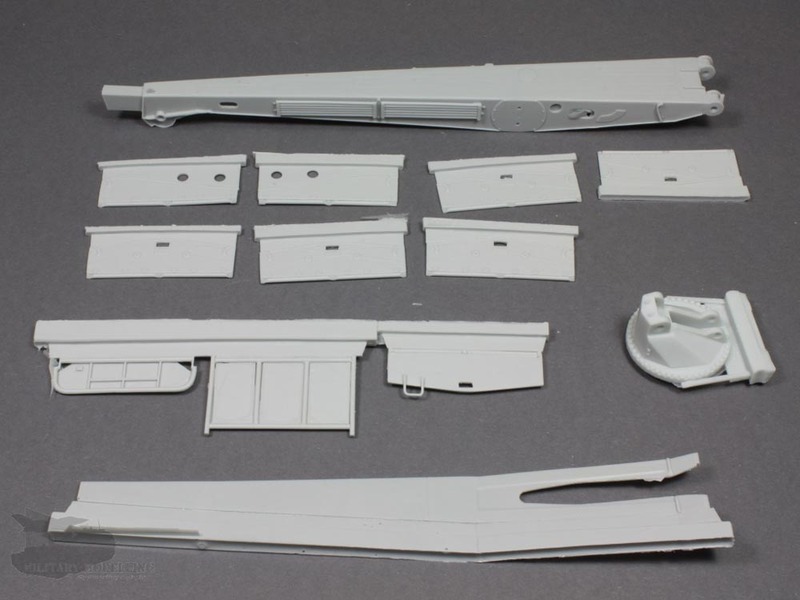 Nevertheless, the interior still has enough room for ambitious model builders to add more detail such as a few cables which can be replaced with thin copper or lead wire and thus lead to a more realistic interior. Take a look at the relevant references for Büffel armoured recovery vehicles. The remaining 361 resin parts provide enough topics in this chapter and could still fill more pages. The components are arranged on "traditional" casting blocks. 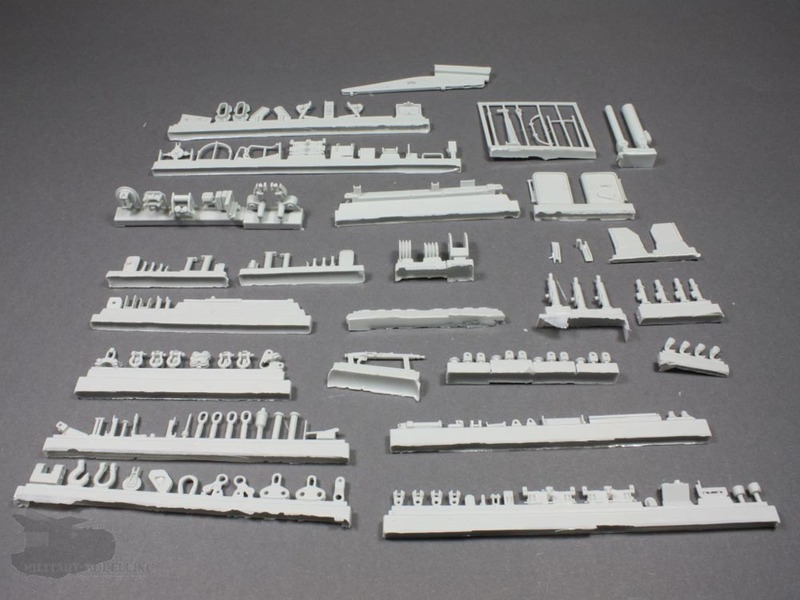 The exception to this are the tool parts which are arranged like a styrene sprue. This prevents accidental breakage of delicate parts in the package. A good and very unique approach, I think. 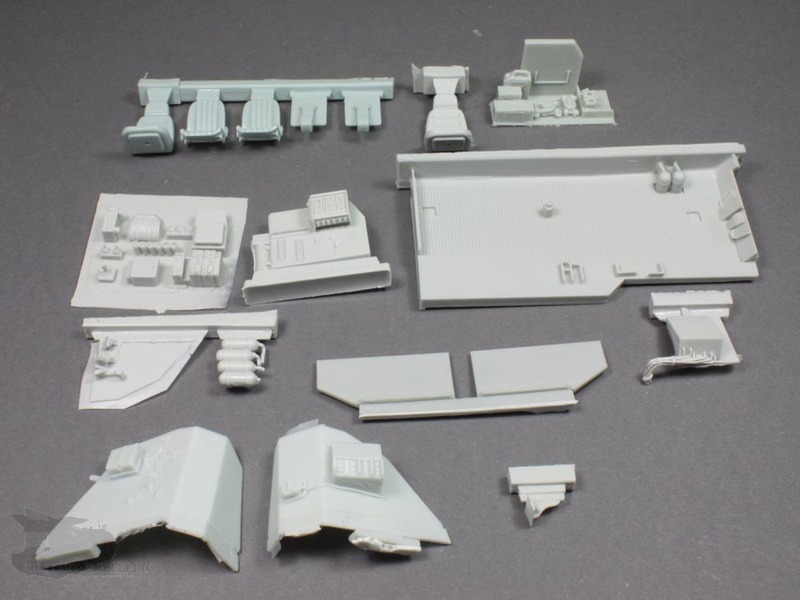 The upper and lower hulls are the largest resin parts included. These are very impressive components, which have to be admired again and again. Only some thin flash in the open hatches has to be removed, which is perfectly normal. Neither component has any casting block. The upper hull contains openings for the driver and commander, and side openings to the interior and storage compartment. Inside, details are already cast around the driver's hatch. Outside, anti-slip surfaces, bolts, welds, tool holders, fans and periscopes are properly rendered, sharp and very well cast. The lower hull contains all of the suspension mounting points and the front winch housing. A first dry fit of these devices proves to be a good fit. PSM have done a good job here. The dozer blade, mounted at the front of the armoured recovery vehicle, consists of nine beautifully designed components - dozer blade, support arms, brackets and pivots which allow movement to be represented. For the assembly, I would recommend the study of references. The arrangement of the pivots needs attention and is not so clear in the instructions. The spring mounts for the rapid recovery system are not included. Here only the mounts for these are included on the dozer blade. The front right of the upper hull of the armoured recovery vehicle has the most prominent feature, the rotating crane. 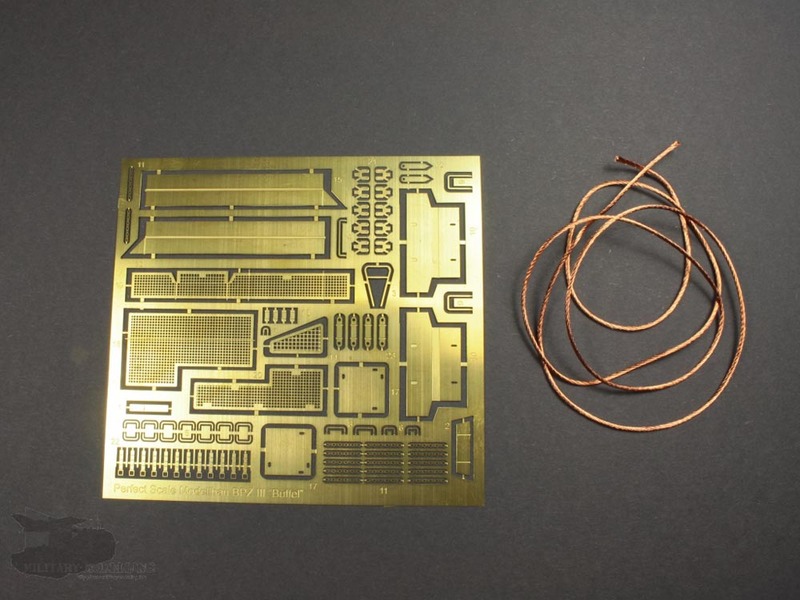 This is a kit in itself with about twenty components which are composed of resin, photo-etched parts, copper wire and decals. Again, I wasn't able to determine abnormalities in the casting at first glance. The dimensions are conclusive and the details of the hydraulic cylinders, rollers, lifting cables and brackets themselves are very good. The entire hydraulic crane can be mounted so that is remains movable. You just have to watch when mounting the hoisting cables in the rollers. This isn't clearly described in the instructions and requires the use of reference material. The remaining components of the upper hull are also designed very nicely. PSM delivers here a really large number of components for the exact detailing of the Büffel. Even the upgraded pulley on the hull front looks ready to use. The commander's cupola and the driver's hatch are designed faithfully and allow an open presentation. The inner periscopes are modelled in the driver's hatch as separate components thus providing the expected level of detail. The periscopes located inside the commander's cupola ring are also included and the MG3 and mounting bracket are precise and delicate. A feast for the eyes! The detail on the rear deck is just as good. 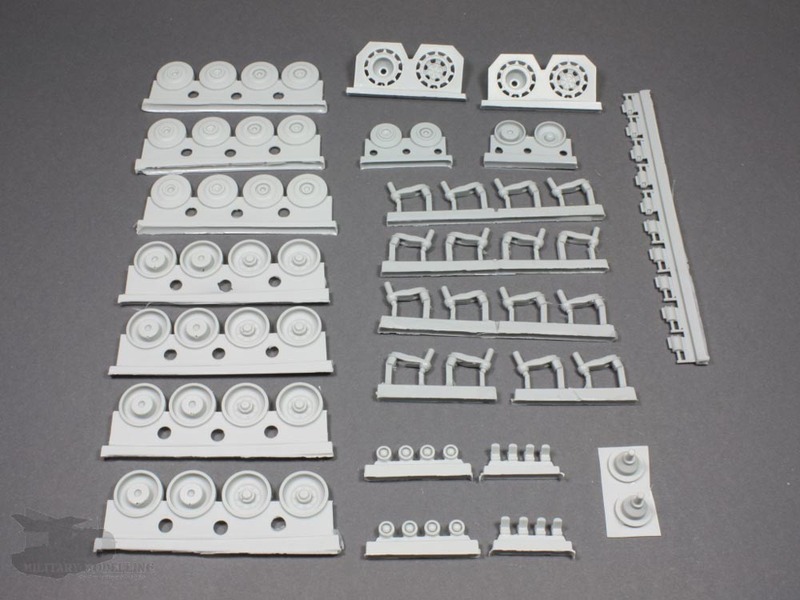 Here the complete engine deck is provided with all the details in excellent execution. It will need concentrated work to put together, and slowly for accurate placement using references - the detail is so fantastic. The smoke grenade dischargers are refined with retaining chains of photo-etched parts. Care must be taken when mounting them to the rails in order to get the proper angles. The recovery winch in the hull front can be shown open or closed. Headlights, smoke grenade dischargers, pulleys, grommets, lifting cables, snow grousers and tool holders are sharp and super detailed. The photo-etched parts add the appropriate refinement. It lacks nothing that my reference study found. This also shows again the first-class work and research of PSM. I want to mention that there is still a second producer of ARV3 Büffel in 1:35 scale. This is from Elite Models. All relevant reviews of the model from Elite Models gives me the opinion that the PSM model, in detail and casting quality, more than outweighs it's competitor. The Elite model has, unfortunately, no interior. As a reference for the construction, I recommend the Tankograd Militärfahrzeug Spezial No.5005. Furthermore, there is sufficient photographic material on the web. Here I would also mention the nice website of Thomas Hartwig, www.panzer-modell.de. The Armoured Recovery Vehicle 3 Büffel, produced by Perfect Scale Modellbau, is a very impressive and unique model. For lovers of modern military equipment, it is the only alternative, as an injection model is not yet in sight. The attention to detail and sharp and consistently excellent castings are particularly noteworthy. The perfectly reproduced interior gives the model additional life and depth. The selection and combination of decals, copper wire, resin, plastic profiles and photo-etched parts is appropriate and well chosen, allowing the appropriate level of detail. 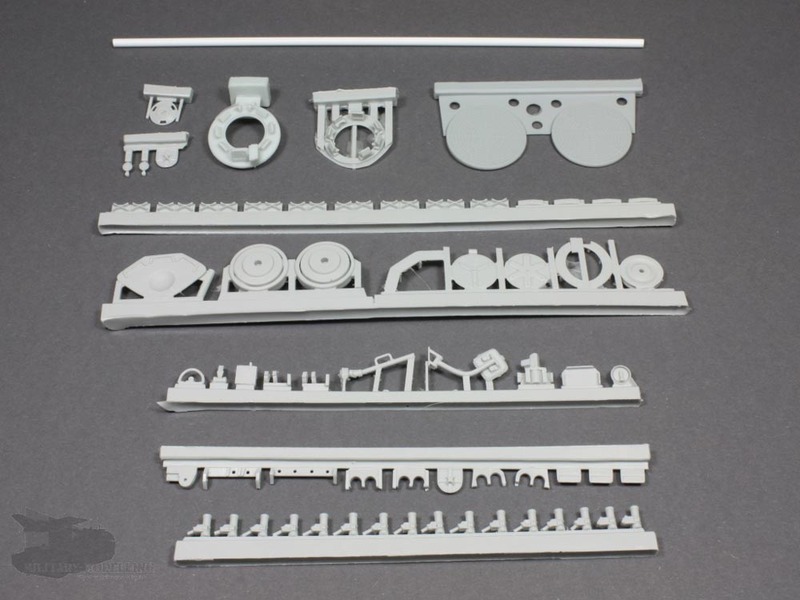 The tracks made of resin, as already mentioned, are my only quiet criticism. For me it was, and is, a favourite model and my expectations were exceeded in any case. The price is quite high, but justified. In fact, it is the perfect execution of the subject. It remains to mention that such a multi-media kit will not fall together out of the box. Reference-study and some modelling skill are essential here. After assembly, you will have an absolutle eye-catcher in your display case. The kit gets from me, as a friend of modern military-modeling, a clear recommendation. 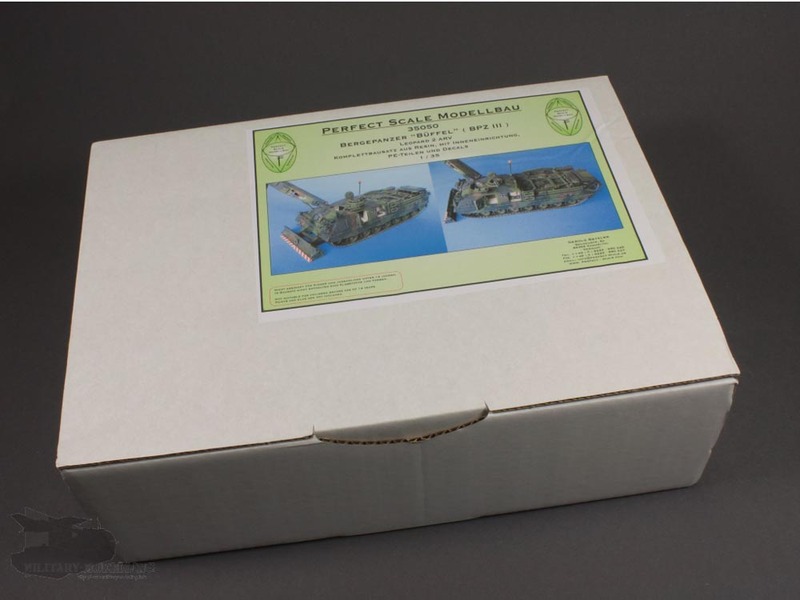 This is a definite highlight in the family of available Leopard 2 kits and conversions on the market. Perfect Scale Modellbau shows again their high level of casting, detail and accuracy of fit in a multi-media kit.